Former San Francisco 49ers quarterback Colin Kaepernick has filed a grievance against the NFL, alleging the owners colluded to keep him out of the league because of his protests during the playing of the national anthem before games. The grievance alleges the league's owners "colluded to deprive Mr. Kaepernick of employment rights in retaliation for Mr. Kaepernick's leadership and advocacy for equality and social justice." Instead of filing the grievance through the NFL Players Association, Kaepernick has hired attorney Mark Geragos, who has represented several high-profile clients, including Michael Jackson, former NASCAR driver Jeremy Mayfield and musician Chris Brown. Geragos said in a statement given first to ABC News Sunday night that the grievance was filed "only after pursuing every possible avenue with all NFL teams and their executives." Kaepernick's goal, he said, was just to be treated fairly and to return to playing football in the NFL, "the league he performed at the highest level for." The NFL Players Association said in a statement that it had been in contact with Kaepernick for the past year about his options, but only today learned he had decided to file the grievance, through media reports. "Our union has a duty to assist Mr. Kaepernick as we do all players and we will support him," the statement said, adding that the union is scheduling a call with his advisers for early this week. 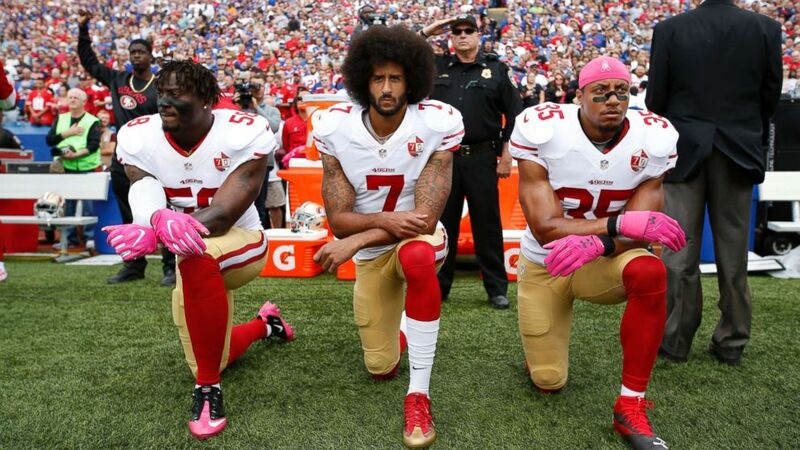 Kaepernick, who has not been with an NFL team since he severed his contract with the 49ers in March, began his silent protest of kneeling during the anthem in the 2016 preseason. He told the media he was protesting against the treatment of blacks in the United States. But Kaepernick's most visible impact seemed to come at the start of this season, even though he himself had not been signed to a team, after President Trump at a campaign-style rally in Alabama slammed NFL players who participate in the protest. In his statement, Geragos did not name the president, but referred to Trump's call for protesting players to be fired, saying: "Athletes should not be denied employment based on partisan political provocation by the executive branch of our government. Such a precedent threatens all patriotic Americans and harkens back to our darkest days as a nation." ABC News' Sunny Hostin and The Associated Press contributed to this report.